Take the Cross-Bronx Expressway to either the Whitestone Bridge or Throgs Neck Bridge. Follow signs for Cross Island Parkway. Take the Cross Island Parkway to the Long Island Expressway (Rt 495) east. Take the LIE to exit 41 north and follow directions * below. Take the New England Thruway (I-95) south to the Throgs Neck Bridge. Follow signs on bridge to Cross Island Parkway. Take Cross Island Parkway to Long Island Expressway (Rt 495) east. Take LIE east to exit 41N and follow directions * below. Take the Hutchinson River Parkway to the Whitestone Bridge. From the Whitestone Bridge, take the Cross Island Parkway to the Long Island Expressway (Rt 495) east. Take the LIE to exit 41N and follow the directions * below. Take exit 41N. Follow Route 106 north. NOTE: Rts 106 and 107 split, be sure to bear to the right. After the split, follow 106 north to Route 25A (fourth traffic light after the split). Make a right on 25A and go east for one mile (you will pass 1 traffic light). When the 2 lanes merge, look for the Chancery entrance on the right hand side marked by two white pillars. Follow driveway to house. Take exit 43N off the LIE and make a right at the light onto South Oyster Bay Rd. Go past a busy intersection (Jericho Tpk) and South Oyster Bay Rd becomes Jackson Ave. Follow Jackson Ave north past the railroad crossing, and stay to the left of the Shell gas station. Follow the signs for Split Rock Rd (to the left of the Rollin Automotive store) and take Split Rock to the first traffic light (Rt 25A). Make a right onto 25A. When the lanes merge, look for the chancery entrance on the right (a driveway marked by two white pillars). Make a right onto the driveway and follow it to the house. Take exit 35N. Follow Route 106 north. NOTE: Rts 106 and 107 split, be sure to bear to the right. After the split, follow 106 north to Route 25A (fourth traffic light after the split). Make a right on 25A and go east for one mile (you will pass 1 traffic light). When the 2 lanes merge, look for the Chancery entrance on the right hand side marked by two white pillars. Follow driveway to house. Take exit 36N and make a right at the light onto South Oyster Bay Rd. Go past a busy intersection (Jericho Tpk) and South Oyster Bay Rd becomes Jackson Ave. Follow Jackson Ave north past the railroad crossing, and stay to the left of the Shell gas station. Follow the signs for Split Rock Rd (to the left of the Rollin Automotive store) and take Split Rock to the first traffic light (Rt 25A). Make a right onto 25A. When the lanes merge, look for the chancery entrance on the right (a driveway marked by two white pillars). Make a right onto the driveway and follow it to the house. 6:00 PM Great Vespers or Vigil. 5:00 PM Liturgy of the Presanctified Gifts. Call 516-922-0550 on Monday-Friday between 9:00 AM and 5:00 PM for other service times and information. With these words, Metropolitan Leonty (Turkevich) memorialized the blessing and formal presentation to him of his new official residence on his name day, July 1, 1958. Half a century ago, as this picturesque 15-acre property where the official residence of the Primate of the Orthodox Church in America and the chancery offices are now located was received, the Church envisioned its transformation into a major spiritual center for the entire Church. The remarkable history of this property, both before and since its acquisition by the Church, provides further insight into this vision. In 1914, Lewis Cass Ledyard Jr. - a prominent Manhattan attorney and great-grandson of US presidential candidate and later, Secretary of State, Lewis Cass - commissioned the noted architect, Charles A. Platt, to construct a house of some 30 rooms in Georgian Revival style on his 75-acre property in Oyster Bay Cove* on Long Island in New York. Delano & Aldrich, a well-known architectural firm, designed other features of the estate, which the Ledyards named “Westwood” and which was destined to become their beloved summer home. Ellen Biddle Shipman, a world-renowned pioneer in landscape architecture, and Annette Hoyt Flanders, also a noteworthy landscape architect, conceived the intricate configuration of landscape, plants and flowers at Westwood, seamlessly blending nature and structures. Even today, their marvelous work is still apparent in the landscape on the property. The original blueprint architectural and landscaping plans of the property are still preserved in the OCA Archives. Lewis Cass Ledyard Jr. died prematurely in 1936 at age 56. In 1948, his widow, Ruth, married William E.S. Griswold, a prominent attorney and businessman who had served as Secretary of the Railroad Securities Commission, appointed by President Taft. In the mid-1950’s, as the era of opulence drew to a close, Mrs. Griswold, like many other Gold Coast estate owners, found it necessary to dispose of Westwood. The tax burden on such properties and changing times compelled many Gold Coast families to sell their estates or donate them to worthy charitable or not-for-profit causes. Some estates became private schools or universities, others - museums, parks or preserves. So it was in this spirit that Mrs. Griswold’s Orthodox attorney approached the Church. At the same time, Saint Vladimir’s Seminary, then located in inadequate, rented quarters at Union Theological Seminary in New York City, was engaged in an extensive search for a new permanent location. Mrs. Griswold’­s lawyer offered the seminary the 15-acre parcel of land immediately surrounding the house. The other 60 acres, which unlike the donated property were buildable lots under local zoning, was put up for sale. Although it was not feasible for the seminary to accept the property, the Church still sought to wisely use this extraordinary gift. Thought turned to the Church’s chancery and the residence of its elderly Primate, Metropolitan Leonty, then located on the premises of Holy Virgin Protection Cathedral in New York City, next to the Bowery, in a deteriorating neighborhood. As the kindly Metropolitan was prone to inviting vagrants off the street in for tea, his personal well-being was becoming an increasing concern, and a residence for him in a cleaner, quieter environment, away from the hustle and bustle and dangers of the city was needed. As a precondition of the transfer of the property, a plan for its projected uses had to be developed. In addition to the residence of the Metropolitan and the offices of the Church administration, this statement of purpose envisioned a chapel, facilities for the Church’s archives, an administrative office of the New York cathedral, and a venue for meetings of the Council of Bishops (as the Holy Synod was then called) as well as for clergy and lay retreats, and for instruction of Sunday school teachers along with other uses consistent with ecclesiastical and civil regulations. Thus, on December 31, 1957, for the nominal sum of $1.00 (plus closing costs), the Church acquired this beautiful 15-acre Westwood property in Oyster Bay. The Church was unable to purchase any additional acreage that was being offered for sale. The house and surrounding land were an unconditional gift to the Church from Mrs. Ruth Griswold. To publicize the vision for a “religious center” on the property, as spelt out in transaction documents, and to raise funds for the building’s modest renovation, an informational brochure was distributed throughout the entire Church. “This is the first time in the history of our Church in America that we have a property of which we can be justly proud. It’s beautiful—it’­s fabulous. We cannot afford to lose it! But whether we retain it or lose it depends upon all of us. This Estate can be a monument to our ability to hold and enhance, or a monument to our failure to progress. Which shall it be?” the brochure proclaimed. Within a few months, the necessary renovations of the building and arrangement of a chapel in the former library were completed. On July 1, 1958, the house was blessed and formally presented to Metropolitan Leonty as his residence, and on October 11, 1958, the Saturday following the old calendar feast of Saint Sergius, the solemn dedication of Saint Sergius of Radonezh Chapel took place. Several hierarchs as well as clergy and laity from New York area parishes attended both of these events. A community of faithful that made the chapel their church home soon formed. Westwood soon also became a place of regular large gatherings for spiritual fellowship and prayer. The annual celebration of Metropolitan Leonty’s name day and a fall pilgrimage to honor those fallen in battle, held yearly for a decade (1959-68), brought busloads of clergy and faithful from far and wide to this sacred and beautiful place. On pilgrimage days, services were conducted in the walled garden, providentially designed by the original architects in a manner well suited for such use. Westwood truly became a focal gathering place for the Church. During the initial years that Westwood was owned by the Church, it served primarily as a residence for Metropolitan Leonty, who used it extensively not only as a place of retreat, but also to receive official and personal guests in its beautiful surroundings. Indeed, Metropolitan Leonty loved to take walks at Westwood and to marvel at the natural beauty of God’s creation there. With a regular liturgical cycle for Saint Sergius Chapel’s growing community of faithful, Metropolitan Leonty often humbly sang in the choir or assisted the celebrant in the altar as an acolyte. In the 1960s, Metropolitan Leonty began to travel less than he had previously and Westwood became his permanent home. In order to facilitate the Metropolitan’s attendance, various ecclesiastical administrative bodies began to hold their meetings at his residence rather than at the Cathedral in New York City. A remarkable encounter took place at Westwood in 1963 when Metropolitan Leonty received a Church delegation from Russia. This visit was the initial contact with the Russian Church, following decades of estrangement, that eventually led to negotiations that culminated in the granting of autocephaly to the Orthodox Church in America in 1970. Following Metropolitan Leonty’s death at Westwood on May 14, 1965, his successor, Metropolitan Ireney (Bekish), wished to maintain his primary residence and the chancery at Holy Virgin Protection Cathedral in New York City. Nonetheless, various meetings continued to be held at Westwood. Perhaps the most historically significant event held there was the March 31, 1970 signing of the agreement on the autocephaly of the OCA by Metropolitan Ireney, representing the Orthodox Church in America, and Metropolitan Nikodim, representing the Church of Russia. With its new status as an autocephalous Church, it was becoming increasingly apparent that the Orthodox Church in America needed a more suitable location for its central offices than within the aging structure of Holy Virgin Protection Cathedral on Manhattan’s lower East Side, where the surrounding neighborhood was still in decline at the time and even such practical concerns as parking were problematic. Westwood was much more conducive to growth and for appropriately receiving foreign Church dignitaries, which the OCA would now do as an autocephalous Church. Therefore, the Metropolitan Council was adamant that the Metropolitan’s official residence and the chancery be permanently transferred to Westwood. This decision was finally implemented effective June 1, 1974. Metropolitan Ireney, however, continued to live primarily at the cathedral. With the relocation of the OCA Chancery to Westwood, the chapel became the spiritual home of the chancery staff. Services began to be conducted in English and a few other families living nearby also continued to attend services here. From 1977 to 1982, Westwood was also home to the nuns of the Community of the Holy Myrrhbearers (now Holy Myrrhbearers Monastery in Otego, NY). The sisters, newly received into Orthodoxy, conducted a monastic cycle of services in the chapel and assisted in the operations of the chancery administration. In the 1970s and 1980s, Saint Sergius Chapel was the site of the consecration of Holy Chrism on several occasions. The Primate of each autocephalous Church consecrates the Chrism used in the Sacrament of Chrismation and for the consecration of Altars and Antimensia in all the parishes of his territorial Church. This is done every few years, as necessary to maintain a sufficient supply of Chrism for the needs of the Church. The consecration takes place at the Vesperal Liturgy on Holy Thursday and is preceded by three days of special preparations, which requires the participation of many clergy. 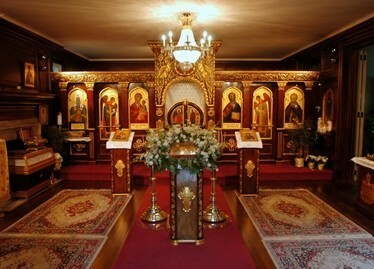 For decades, Saint Sergius Chapel has also been the site of the regular biannual meetings of the Holy Synod of Bishops of the Orthodox Church in America. It is here that, twice a year, all the diocesan bishops gather to celebrate the Eucharist and, within the prayerful atmosphere of the chapel, discuss and deliberate matters concerning the life of the Church. Various other meetings are held in the chancery building throughout the year. All are preceded by corporate prayer in the chapel, which in recent years has become home to relics of the North American Saints as well as several other saints, most notably Saint Sergius of Radonezh, the chapel’s heavenly patron. Countless guests from all walks of life visit the Chancery every year. All are offered the opportunity to venerate and pray before these holy relics. In this stately house, the Primate of the Orthodox Church in America regularly receives foreign Church delegations and other dignitaries. Included among the primates of foreign Churches who over the years have visited the OCA Chancery and have prayed in Saint Sergius Chapel are: Patriarchs Ignatius of Antioch, Pimen and Aleksy II of Moscow, Ilya of Georgia, Maxim of Bulgaria, Archbishop Anastasios of Albania and Metropolitans Basil and Sawa of Poland and Dorotheus of Czechoslovakia. Many other Orthodox hierarchs have also visited. With their proximity to several airports and other significant research repositories in the New York City area, the OCA Archives are regularly visited by historical researchers from throughout the world, ranging from a monk in Greece doing a graduate thesis on Saint Herman, a Russian scholar living in Scotland researching Orthodox music in America, a crew from Tatarstan producing a film on the Kazan icon of the Mother of God to a restorer attempting to find information on the original decoration of St. Nicholas Cathedral in New York. The OCA Archives also provide research and documentary support to the chancery administration, dioceses, and parishes and in response to official inquiries from other jurisdictions. The archives have likewise played a crucial role in preparatory research and work towards the glorification of the Orthodox saints of North America, most recently jointly with the Antiochian Archdiocese for the canonization of Saint Raphael (Hawaweeny), Bishop of Brooklyn. Very soon after Westwood was acquired by the Church, the archives were moved here from the Cathedral in New York City. Father George Afonsky (later Archbishop Gregory of Alaska) began systematization of the invaluable historical documents tracing the Church’s history from the Alaskan mission in 1794, and providing a fascinating chronicle of God’s work in the Church in North America. While serving as archivist, he also pastored the Saint Sergius Chapel community from 1965 to 1971. The volume of the archives is extensive and the weight, staggering. To keep all historical material together at one location, space considerations soon forced the relegation of these sizeable collections to the basement even before the chancery administration moved to Westwood. The most significant documents, including some handwritten by the North American saints, are kept in the basement’­s room-size safe, protecting them from fire or other calamity. In order to more properly assure the long-term preservation of the OCA Archives and to provide additional space for the ever-growing archival collections, some thought has been given for more than two decades to the need for a more suitable environment for their safekeeping, possibly by constructing another building on the Westwood property. In 2003, the Holy Synod approved the commissioning of a professional feasibility study to explore the possible construction of such a facility. However, due to financial constraints, this study has not yet been undertaken. In 1991, the beautiful iconostas of Saint Sergius Chapel, crafted by master woodcarver Gleb Greitz in the early 1960s, was refurbished and gold leaf was added to give it a completely new look. More recently, new icons with panels depicting the lives of the North American Saints have been added on the chapel’s walls. Today, Saint Sergius Chapel maintains a regular cycle of services, celebrated by the clergy assigned to the OCA Chancery. Participation in the liturgical services in the Chapel affords those who work at the Chancery the opportunity to place their labors in the proper spiritual context of common prayer, shared worship, and unity in the Eucharist. All those who wish to pray in Saint Sergius Chapel, to venerate the relics of the saints enshrined here, and to see the beautiful building and grounds at Westwood are most welcome to visit. * For those not familiar with local geography, a clarification about the location of Westwood is in order: it is located in the tiny Village of Oyster Bay Cove, which does not have its own zip code. Therefore, for mail delivery purposes the address must be designated as Syosset, which is actually a larger neighboring hamlet with a post office.